Forty Days Celebrating Forty Years! We left Zurich at 10:02 and arrived in Strasbourg, France at 12:43. It was necessary to change in Basel, which involves a five-minute walk to the French train station (just follow the signs). We had time to pick-up sandwiches and drinks for lunch on the train, which was there waiting for us. We had planned to take a day trip to Colmar during our four-day stay in Strasbourg and decided to save a train day on our passes and just drop our bags at our hotel and head right to Colmar, a mere half-hour train ride away. At the train station in Colmar, there are frequent buses to the old town (.90 EUR), which is about a ten-minute ride. It was coffee and pastry time and fortunately we spotted Richon, 8 rue Stanislas, where Linda had her addiction to iced coffee with chocolate ice cream and whipped cream satisfied. I enjoyed a perfect double espresso and vanilla éclair - really good stuff. The old town, steeped in history and a tradition of art, has been lovingly restored. We stopped at the tourist office for a map, which also offered a "discovery trail", a numbered town walk. Off we went, determined to follow it to the number. Alas, we got so caught up in the beauty of the 16th and 17th century half-timbered houses flanking the narrow cobblestone streets, I put the map in my pocket and we followed our senses. It's a glorious medieval setting within a large pedestrian zone. The most romantic district is "Little Venice", where old boatmen's houses and former laundries line the banks of the canal. Colmar is located in the heart of the Plain of Alsace and is a great place to headquarter while visiting the Route du Vin. 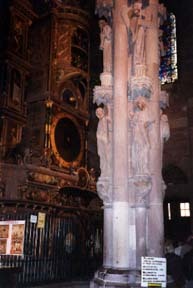 We have visited Strasbourg twice in the past, long before we were writing travelogues. 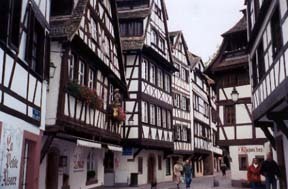 It is the seventh largest city in France and is nestled in the Alsace region in the northeast corner of the country. Originally Alsace was part of the Germanic Holy Roman Empire but through a series of conquests became part of France. 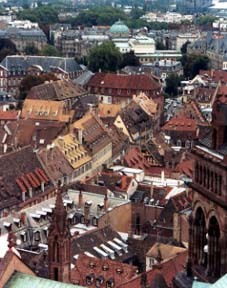 There is still a flavor of German culture (particularly food) that gives Strasbourg an enjoyable uniqueness. It's a modern, dynamic town, home to the Council of Europe and the European Parliament and, at the same time, the past lives on in tasteful stone architecture, a magnificent Cathedral and La Petite-France, the old quarters of the town. A lovely river and canals run through the city, with easy bridge and waterway connections. It is delightful to walk along the banks, gaze from the bridges and we discovered that since our last visit wonderful boat tours are now available. The Hotel du Dragon, 2 rue de L'Ecarlate, at the corner of rue du Dragon, is ideally situated for easy walking visits to all key sights. As is our custom, we walked there from the train station, crossing the river at Pont St. Thomas, which took twenty minutes. On the way back to the train station, we took the tram from the stop a few minutes walk from the hotel. Hotel du Dragon is an original 17th century house, which has been completely renovated in a contemporary style. The pleasant, helpful staff all speak English, as well as the owner-manager, Jean Zimmer, who always seems to be there when you need him with knowledgeable advice. Our top floor room was spotlessly clean and roomy, even if there was a supporting column I had to be careful to avoid during the night. The bathroom was a big hit with Linda as it had a bidet. The breakfast buffet offered a good selection of quality products to augment the bread and jams on our table in the bright and airy breakfast room. In good weather you can eat in the pretty courtyard. Room rates are reasonable and represent excellent value. A short walk from the hotel is the Restaurant and Winstub Au Pont Corbeau, where we had a delightful dinner. It's tiny, with tables packed tightly together. The menu and the chatter of local patrons is all French. The owner speaks English and was there to help with our choices and made us feel like regulars. Within minutes of our arrival, every seat was taken and people were being turned away. You must reserve! After relaxing over a carafe of a light and lovely local Pinot Noir, we perused the menu and the menu of the day. We ended up choosing from both, starting with warm leeks and chopped egg with a tasty blend of vinaigrette and olive oil served with bread and tapanade, a joy to behold and a delight to savor. My lapin confit on a bed of ratatouille was superb as was Linda's potato pancakes and salad. An outrageous bread pudding with sour cherries and vanilla ice cream completed our evening. It was a wonderful experience at a very reasonable price. Le Petite France is an extremely pretty quarter of half-timbered houses from the sixteenth and seventeenth centuries, the most beautiful of which is the Tanner's House from 1572. In the past, these homes were occupied by fishermen, millers and tanners. The river and canals surround and run through the quarter making it a dreamy, relaxing excursion back in time. 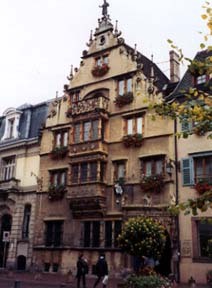 Restaurant Strissel at 5, Place de la Grande Boucherie (Tél: 03 88 32 14 73) is pure Alsatian. Housed in a half-timbered structure, the two story interior is all wood with gorgeous stained glass leaded windows. It is famous for choucroute, which was being served at just about every table. It was lunch hour and the place was packed with locals. We had to wait a bit for seating upstairs but we had time before we would be taking a boat tour from the nearby landing. I would have loved one of those heaping servings of sauerkraut and pork but in the interest of keeping my pants buttoned, we had decided to eat a bit lighter. So it was that we settled upon marvelous quiche Lorraine and onion tart. The boat landing is a few minutes south of the Cathedral. We had walked a good part of the city and thought we had a good feel of all its parts. This very worthwhile boat excursion gave us a whole new perspective. Instead of taking pictures of the lock gates of the old tanners district, we went through them. We felt the romance of the river banks and got to see magnificent buildings and homes in areas we had never reached. We went far enough to see the modern glass and steel buildings of the European Parliament for the first time. 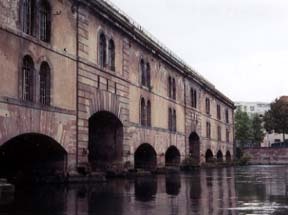 The stunning Le Barrage Vauban (Vauban Dam) was built in 1681 to reinforce the obsolete medieval fortifications. Under the thirteen arcades of this bridge, the flood gates could be closed and the southern front of the city flooded, keeping it safe from attack. Another level was added in the nineteenth century and a panoramic terrace set-up in the sixties. You really see Strasbourg in a different light by boat. We had read about a restaurant on 15 rue Sainte Barbe which sounded interesting. When we got there, we found that it was gone and the new incarnation is called Le Panier du Marche <panier-du-marche@wanadoo.fr>. We stood outside with a disappointed look, I guess, because a waiter came out to tell us the change took place not so long ago and that if anything, it was now better. We liked his sincerity and followed him in. We don't know what the other place was like, but this was a lucky find. The refined design of soft gold walls with rose print fabric upholstery, drapes and upper walls creates a cozy, warm feeling, which carried over to the caring service by the staff. The menu and wine list are simplified to offer excellent value. There is only a three course menu offered at 27 EUR with wonderful choices for each course. The wine list is offered in three price categories, 14, 19 and 22 EUR, with nice selections in each. The chilled Pinot Noir at 14 EUR was very nice. Our appetizers were heavenly: a salad of fresh garden vegetables, rare roast beef and pate, and grilled sardines wrapped in thin pastry with two hot sauces. We both chose fish for our main courses. Linda had swordfish accompanied by tender ravioli and I enjoyed small, whole hake in a delicate sauce with turnip. Both were lovingly prepared and presented as was the dessert course, a vanilla soufflé with cherry sauce and four fruit flavors of homemade sorbet served on a burnt sugar wafer and sprinkles with pomegranate seeds. As I said, we got lucky! Our innkeeper suggested that we visit two nearby historic sites that were off the tourist-beaten track. Le Hara National de Strasbourg (National Stables) whose mission it is to promote and develop the activities of horses has been in existence since 1756. The historic and beautiful stone stables and training grounds are located at the junction of rue Sainte Elizabeth and rue des Glaciers. As part of the large hospital complex at 1, Place de L'Hopital is the Cave Historique des Hospices de Strasbourg. In this cellar you will discover the part played by wine in the history of hospital care. Wine quenched thirst, relieved pain and lessened hardship in expectations of better days to come. The cellar with impressive vaulting has enabled wine to be kept for mass and for daily meals for six centuries. Not only do they offer high quality Alsatian wines at extra-special prices that have been selected by their wine tasting committee, they will also be happy to give you personal advice and aid in your selection. Our mission was to buy the lowest priced bottle, Le Peche de Bachus, a sensational red, which set us back a mere 2.97 EUR! Just around the corner at 23, Quai St. Nicolas is Le Musee Alsacien. 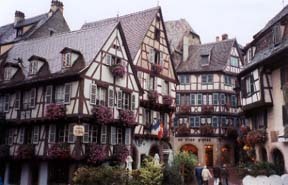 It was established in 1907 in three beautiful Renaissance houses to show the richness of the Alsatian culture. Through clever reconstruction of different areas one follows a tour of the region, from the austere life in the valley to the affluence of the wine grower, to the blacksmith and carpenters' workshops and others. 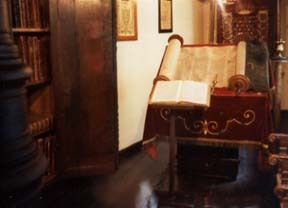 Many artifacts, such as painted furniture, toys religious images (including a special display of Jewish religion and culture), ceramics, imagery and costumes. This folk art museum is beautifully presented and maintained. We selected Munster Stub, with typical woody, 'winstub' atmosphere, as our dinner venue and we heartily recommend it to you for caring service, great environment and quality food at reasonable prices. We arrived at 19:00 and joined the locals filling the tables. This is another family-run establishment. There have been very few any tourists in any of the restaurants we have patronized. We were presented with a plate of salami and bread as a house-offered starter. We shared an exquisite fish quiche to start and ordered rack of lamb for two. The lamb was truly outstanding, cooked to pink inside and as tender and tasty as the best we've ever had. Sides of sliced, sautéed potatoes and crisp green salad were seasoned deliciously and were a good marriage with the lamb. Laundry day! The hotel suggested a place a few minutes away on rue de Bain Finkwiller, right off Quai Finkwiller - you can't miss it. They also have pet shower stalls in the rear. The Cathedral dominates the center of town and rightly so - it is an imposing structure! The first stone was set in 1277. The 142 meters-high spire was finished in 1439 and was the highest in Christendom until the 19th century. It's a marvel of lace-like work in stone with an elaborate sculptured decor. The interior boasts a glorious collection of stained glass windows from the thirteenth and fourteenth centuries and a pulpit which is a gem of Gothic art. In the right arm of the transept is the Pillar Angels, a masterpiece of Gothic sculpture and the astronomical clock with the twelve apostles parading before Christ every day at 12:30! Linda wanted to take photos going up to and from the platform way up to the spire. Round and round we climbed up the 330 steps, enjoying the great views all the way up then going down. Time for a break at our favorite coffee place around the corner at 31, Rue des Hallebardes, Cafes Henri. They have other locations but this is the only one in the center of Strasbourg. Their super delicious cappuccino and espresso is served with a square of their own dark chocolate. To complete the Cathedral visit, we returned to the adjoining Notre-Dame Museum installed in fourteenth and sixteenth century buildings. On exhibit are masterpieces of medieval sculpture, which were originally in the Cathedral, major works of art from the Rhenish fifteenth century and a gorgeous collection of stained glass windows that were saved after being hidden in south west France and in salt mines in Germany. After so many wonderful dining experiences, we wondered if it could continue on this our last night in Strasbourg. Not to worry, winstub Chez Yvonne kept the dream alive. We were seated on the second floor, which is comprised of several rooms from which we chose a non-smoking environment (the first to offer that choice). Since we were both beginning to feel fat-guilt, we decided to only have a main course, which we did, but not before we demolished delicious bread with spread from the pot of fabulous mustard on the table. Tender, delicious veal steak, medium rare, and quail stuffed with liver pate were both wonderful, served with crispy fried potatoes and sautéed mushrooms, all with delightful service and reasonable prices. 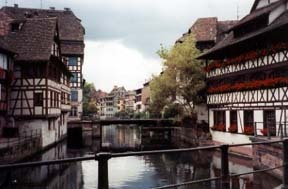 Strasbourg is a cultural and atmospheric delight. We found the accommodation and dining to be of very good value and although it is a bit off the geographical beaten track, it should be on everyone's wish list. Because the train ride from Strasbourg to Annecy is such a long one, we decided to split it up with an overnight stay in Bern. Leaving Strasbourg at 10:55, we arrived in Bern at 14:11, with a change in Basel. It was a short walk to the Hotel Baren. This is a Best Western and is a typical North American chain-type accommodation and did not represent very good value. There was no air conditioning and it was warm but with windows open, our front room was too noisy at night. 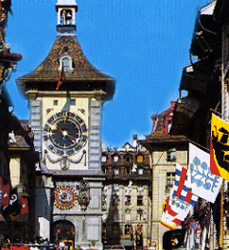 It is difficult to find reasonably priced hotels in the major cities in Switzerland. There are many fine hotels but they are very expensive. Bern is an old friend. We walked the porticoed streets (there are six kilometers of these covered streets) and found that everything was as we had left it - comforting. We stopped by our favorite traditional Swiss restaurant to make a reservation before we went back to the hotel to rest and clean up. Actually, restaurant Della Casa is only a few steps from the hotel, Schauplatzgasse 16 (031/311 21 42) <della.casa@bluewin.ch>. This restaurant is an institution, the number one choice of politicians (Bern is Switzerland's capital) and locals. There are two floors, both serviced by very experienced, mature waitresses, who are only too happy to become your mom from the moment you sit down. I love that. There's a big Swiss kitchen and mom is happy to explain the menu, help with your selection and make you feel right at home. It was game season and a good Swiss restaurant usually excels in this category. This is an excellent kitchen and if anything they over-achieve. Linda had luscious veal liver with rosti and I had a deer feast; tender filets were served with an array of goodies, including spaetzli, red cabbage with wine, chestnuts, brussels sprouts, peach halves filled with currants and pear halves in wine. On the side was an out of the garden mixed leaf salad with chopped egg. The portions are killers but the good news is the second portion is keeping warm in pots nearby so you can take your time and savor every mouthful, and I did. So much, so good, let's not stop! Bring on the three balls of ice cream with hot chocolate sauce and real whipped cream. I love Restaurant Della Casa. It is all so very reasonably priced and represents excellent value. The food is even better than my mother ever made, but don't tell her I said so! Breakfast was awful, thank goodness. There was a farmers' market early in the morning on the streets and Bundes Platz outside the hotel. We bought a gorgeous fresh olive bread and olive spread for the train and it was ecstasy all the way to Annecy.